Craig Johnson poses next to the fireplace at Amato’s Woodfired Pizza, 6 S. Sandusky St., in downtown Delaware. He and fellow co-owner Brad Hampu plan to open their third location in Marion by early 2018. A pizza eatery based in downtown Delaware has fired up its expansion plans in central Ohio. Amato’s Woodfired Pizza will open its third location at 143 W. Center St. in downtown Marion to increase its capacity. Owners Brad Hampu and Craig Johnson purchased the building last month for $500,000, according to the Marion County Auditor’s Office. The new location is expected to open at the beginning of 2018. Officials with Downtown Marion, Inc., a nonprofit revitalization organization in Marion, believe Amato’s will boost the downtown district’s reputation. In contrast to its Delaware restaurant, Amato’s is partnering with Columbus-based North High Brewing Co. to provide its selection of craft beer at the Marion location. But the difference will end there. The Marion Amato’s will continue to offer the same specialty pizzas, appetizers, pastas, subs, salads and desserts found at the downtown Delaware restaurant, which opened at 6 S. Sandusky St. in 2010, with a carry-out location next door. Although the Delaware location is expected to lose some of its Marion customers when the new location opens, Johnson said it will pick up new customers from southern Delaware County. In early June, the company opened its Mount Vernon location at 668 N. Sandusky St. Johnson said selecting that area was similar to Marion. The owners like to open their locations in low-activity areas that are on the verge of revitalization such as Marion and Delaware. “We see a lot of downtown Delaware 10 to 12 years ago in downtown Marion and I think that there are tons of opportunity for growth and tons of potential there,” Hampu said. “It’s about to explode in downtown Marion,” Johnson added. Meadows added that she hopes the relationship with Amato’s will be of mutual benefit, since the restaurant will be located in the heart of the proposed Marion Cultural Corridor. The corridor is a nearly 1.5-mile long section of the city that is bordered on the east by the Harding Home on Mt. Vernon Avenue and on the west by Marion Union Station on West Center Street. Downtown Marion officials hope it becomes a destination for dining, shopping, the arts, and entertainment. 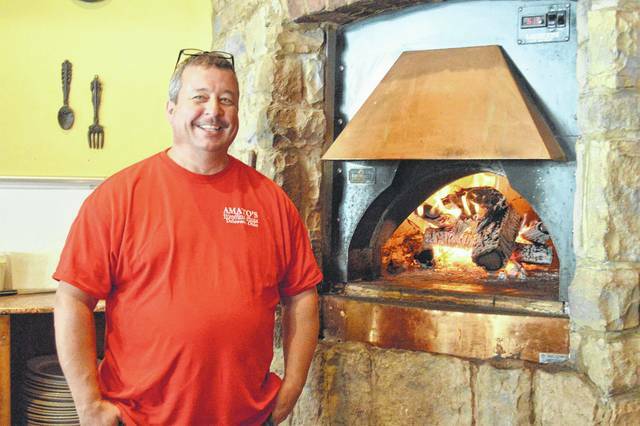 https://www.delgazette.com/wp-content/uploads/sites/40/2017/07/web1_DSC_0006.jpgCraig Johnson poses next to the fireplace at Amato’s Woodfired Pizza, 6 S. Sandusky St., in downtown Delaware. He and fellow co-owner Brad Hampu plan to open their third location in Marion by early 2018.